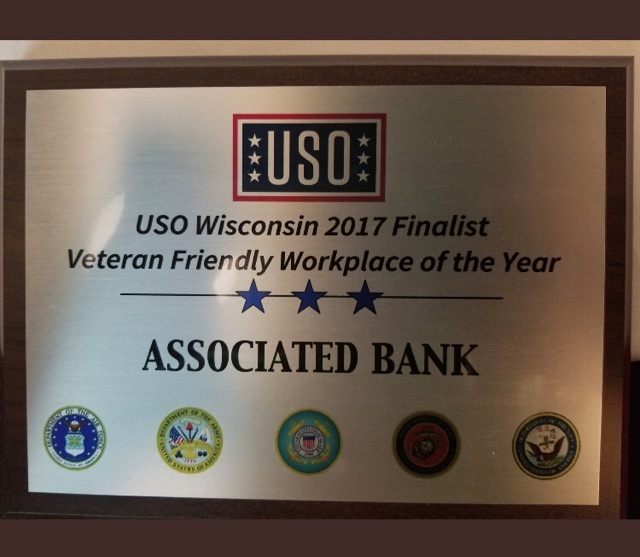 On October 21, USO Wisconsin held their annual “Heroes of Wisconsin” Gala, a patriotic celebration honoring U.S. military members for exceptional service, recognizing Associated Bank as a Veteran Friendly Workplace. The dinner event featured a speech from First Sergeant Matt Eversmann (Ret. ), a decorated war hero and military leader, and an awards ceremony. For the second year-in-a-row, Associated was among the five finalists recognized for demonstrating best practices for hiring and retaining veterans. Colleagues from Associated Bank’s colleague resource group, The Associated Veterans Network (AVN), were in attendance. Jennifer Ray, senior talent acquisition consultant, accepted the finalist award on behalf of Associated Bank. “Through the Associated Veterans Network we are also able to offer many resources and support for colleague veterans and their families,” added Ray. The USO strengthens America’s military service members by keeping them connected to family, home and country, throughout their service to the nation. USO Wisconsin’s mission is to enhance the quality of life of military members and their families who reside in or transit Wisconsin. For more information, visit USOwisonsin.org. Associated Bank is committed to supporting veterans and military personnel and proudly offers benefits to our military colleagues including leave time, retention of colleague benefits and full pay for colleagues on training and active military leave. Our Deployment Trip program also provides financial assistance to colleagues visiting a loved one prior to deployment. For more information visit AssociatedBank.com/Careers/Diversity-Inclusion.